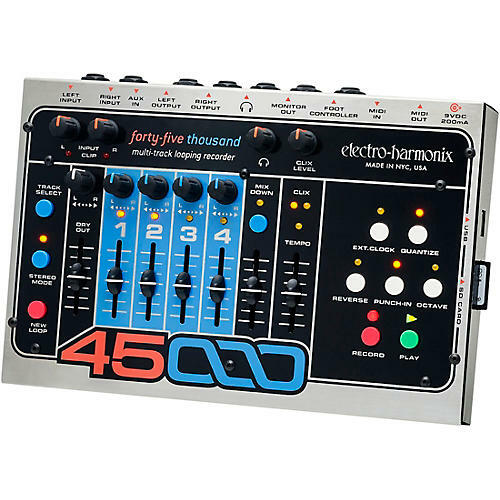 Building on EHX's looper legacy, the 45000 combines the familiar controls of a multi-track digital recorder with state-of-the-art features making it possible to create complex multi-track loops quickly and easily. Each loop has four mono tracks and one stereo mixdown track. The 45000 records non-compressed, 44.1kHz/16-bit CD quality audio direct to a removable SDHC card (4 to 32GB). Each card holds up to 100 individual loops accessed with the optional 45000 Foot Controller (sold separately). Loop speed is adjustable over a two octave range, and reverse recording and playback are also possible. For extra convenience, a built-in metronome to a separate Monitor Out and a Headphone Out are also included.